Tis the season for finding that gift! Are you a parent trying to think of what to get your swimmer for the holiday season? Or is your best friend a swimmer but you have no idea what to get him/her? Or are you just trying to get a present for your siblings to avoid that awkward moment during the family gift exchange? Either way, if you are looking for swimming gifts for this holiday season, you have come to the right place! With the undeniable popularity of their one-piece swimsuits, you’ll be hard pressed not to see them during any swim meet warm-up. Jolyn now has expanded ranges of dryland apparel (hello soft leggings! ), 2 piece swimsuits, and a variety of different back types for one pieces. If your swimmer needs a new training suit, fashionable bikini, or dryland gear, you can bet you’ll find them something at Jolyn. Not sure of a size or suit style they will want (hey Dad, we’ve all been there) then a gift card is perfect! Do you know anyone in your life that seems to practically live on “Meet Mobile”? Do they frantically look at their Splash magazine as soon as it comes in the mail, or snag the Speedo catalog when it arrives? If you have a swim nerd in your life, this 12 month subscription is the perfect gift - and it keeps on giving! There is nothing cuter than gifting the swimmer in your life accessories or jewelry to show their favorite sport some love even when they’re outside of the pool. 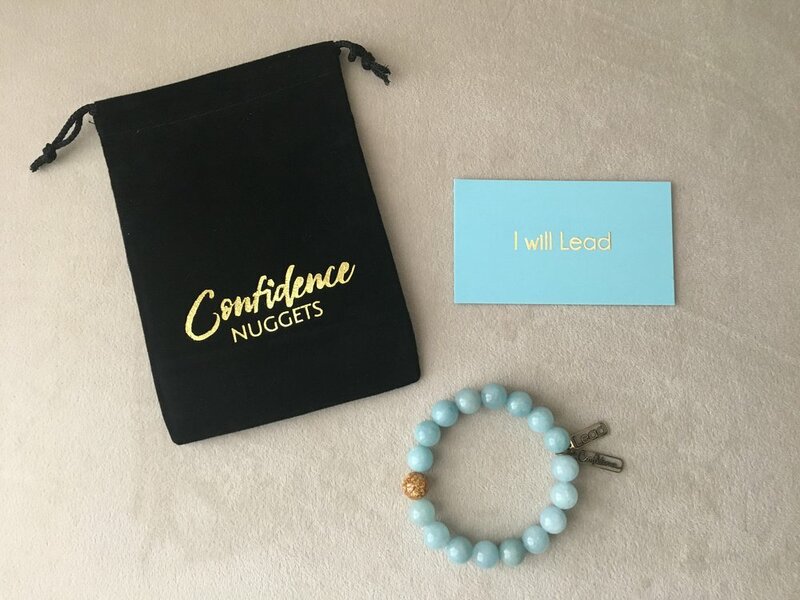 Our newest obsession is this collaborative bracelet between Confidence Coach Christen Shefchunas and the LEAD Sports Summit with their special edition: “I will LEAD” Confidence Nugget bracelet. It reminds whoever wears it that they are strong, confident Leaders. Also searching sites like Etsy and Swimoutlet.com is a no-brainer for this sort of thing! You truly cannot go wrong by giving the gift of sight. Every swimmer loves to get new goggles and you can definitely guarantee they won’t go to waste. Our favorites are the Pink Vanquisher Speedo goggles you catch Missy Franklin wearing in nearly all her races. Hey - if it’s good enough for Missy, it’s gotta be good enough for the swimmer in your life! Something that can give that extra push of motivation when the dreaded 5am alarm comes ringing is some rad wall art. Most kids and teens enjoy hanging their favorite singer or boy band on their bedroom walls - but not swimmers! We have scouted out the best places for some awesome swim-art: this classic shot of the G.O.A.T., this motivational saying, a Touch The Wall movie poster, this geometrical pool dream art, and this little kick-in-the-pants slogan we all need to remember from time to time. Do you live close to a TYR Pro Swim Series meet? Or perhaps you are able to make a trip out to one of the larger competitions such as NCAA’s (Women’s in Columbus, OH/Men’s in Minneapolis, MN) or Phillips 66 Nationals in Irvine, CA. Giving your swimmer the opportunity to watch some of the fastest athletes in the sport compete at a high level can truly be exciting and inspirational! And hey, if you get two tickets you can tell people you saw Katie Ledecky swim in person too, which is pretty cool! Never underestimate the need for a swim parka. Cold at a meet? Put the parka on. Cold and you don’t want others to see you still in your pajamas rolling up to practice? Grab your parka. Too lazy to look like a real person after practice? Shoveling your parent’s driveway? Trying to stop your hair from freezing as you go to the car? Parka. Parka. Parka. Whether your swimmer competes outdoors in sunny Florida or live in the cold state of Minnesota, the usefulness of a parka is endless. Our newest favorite is this swim parka made specifically for girls by girls! Check it out here and get in on the action early by donating to their kickstarter campaign. The ultimate Christmas gift. For the teenage swimmer girl that has it all, get her the gift of self-confidence, empowerment and an opportunity to hang with her swimming heroes! The LEAD Sports Summit, founded by Kara Lynn Joyce, is a 4-day 3-night event that takes place in Atlanta, GA over Labor Day weekend. Attendees will learn about nutrition, confidence, leadership, perseverance, mental health and so much more! Tickets go fast so if you do end up snagging a spot, consider yourself lucky. Subscribe to our newsletter to stay in the loop! Roll up to any practice or swim meet in America and expect to see swim bags of all shapes, sizes and colors. Gift your swimmer a bright new swim bag to lug their gear around comfortably and give them a new canvas to collect all their favorite autographs. Getting them embroidered or matching their team colors is always a nice touch. We’re loving this TYR American themed backpack because you can never go wrong representing the red, white and blue! Probably one of the most innovative and proven ways to correct technique mistakes is to use video review. Give your swimmer the gift of all 4 strokes by signing them up for a private lesson at SwimLabs. SwimLabs employs Olympians at some of their locations making it the ultimate 1-on-1 session they’re bound to never forget! They have locations nationwide, check here to see if there is one near you!